Generating an optimal hybridoma starts with selecting the best immunization strategy. With the Hybridoma Generation for Therapeutic Antibody Service, immunization options include, protein, whole cells, DNA immunization, or any combination of the three. Hybridoma generation continues with high efficiency electrofusion, increasing the amount of fusion events and therefore the likelihood of immortalizing essential lymphocytes compared to chemical methods. Finally, we make sure you capture the next potential blockbuster mAb drug with our high-fidelity selection. High throughput screening for affinity measurements, epitope binning, and isotyping allows for rational selection of top clones. 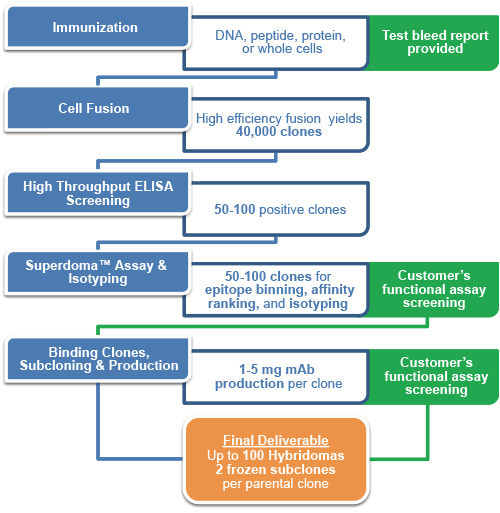 Ultimately, final clonal selection is based upon performance in customer's functional assays. Qualifying clones meeting the customer's criteria can confidently be moved along the therapeutic antibody drug discovery pipeline, integrating seamlessly with sequencing and subsequent recombinant antibody engineering. One stop solution: from antigen production to hybridoma development and characterization. Full spectrum of immunization approaches: protein, peptide, whole cells and DNA immunization. High throughput screening: Proprietary NativeSelect™ ELISA or HT March™ for high efficiency screening. Comprehensive functional assay: Validated functional assay platforms provide reliable in vitro screening. Readily integrated downstream services: Ab sequencing, Ab humanization, rAb production and anti-idiotype antibodies for your Ab drug PD/PK studies. 1) This protocol is for you reference, and we can customize your project base on your specific requirement. 2) We provide free cell line storage service for 6 months from the date of cell freezing. If customers require continued storage service after the end of the six-month period, the charges are set at $38 per cell line per year, and $350 per cell line for a working cell bank service (up to 30 vials). DNA Immunizations, our specialty. Circumvents in vitro protein antigen production and deals with difficult targets. High Throughput Gene to Antibody up to 1mg of recombinant antibodies in as little as 3 weeks.